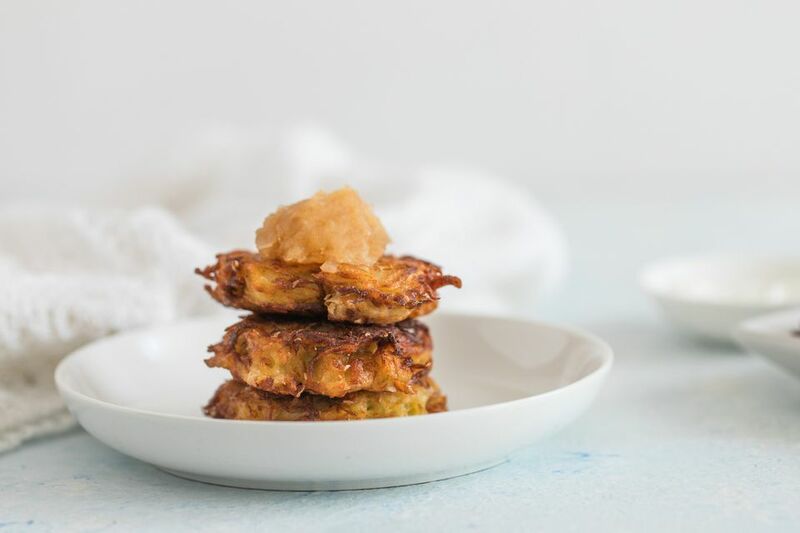 These crispy fried potato pancakes are incredibly delicious and addictive. Grate potatoes by hand if you want to make a batch from scratch or if you're in a rush, use frozen hash brown potatoes. Just remember to thaw and drain well—the less water in your potatoes, the crispier the latkes will be. Garnish with sour cream and dill for a kick of flavor or applesauce if you're serving at Hanukkah. Dry the potatoes as much as possible. You can place them in a kitchen towel and wring. In a large bowl, combine all ingredients except the oil and mix well. Heat oil in heavy skillet over medium-high heat. Place 1/4-cup spoonfuls of the potatoes mixture into the oil, pressing down gently. Cook until brown on one side, then turn and cook until brown on the other.